One thing that a lot of parents in the US overlook is the laundry detergent we use to wash our baby’s clothes, bed sheets, diapers, and bibs. For some parents, it’s easy just to pop it all in the wash together with the rest of our ‘adult’ clothes to get it done quickly. However, babies are young and have not fully developed, and without even realizing it, your baby could have super-sensitive skin that can become irritated by traditional adult detergent. In some cases, your child may be suffering from allergies, such as asthma or eczema, the symptoms of which may only become worse with normal detergent. Fortunately, there are a ton of baby-friendly detergents out there for you. Enabling you to make an effortless decision, I’ve compiled a list of some of my favorite laundry detergents. These are guaranteed to be soft on your baby’s gentle skin while providing you with all the results and benefits you would expect from a regular detergent. Why Can’t I Use Regular Detergent? Why Should I Buy a Natural Detergent? So, What Chemicals Will I Need to Avoid? How Effective Are Baby-Friendly Detergents at Removing Stains? 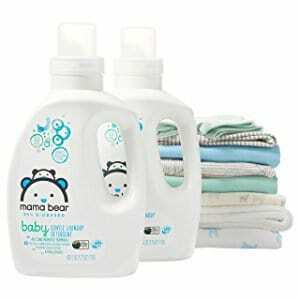 Easily one of the most effective yet affordable detergents to start my list, Mama Bear puts your baby and their health first. Mama Bear detergent has been approved by the USDA, certified to hold an incredible 95% bio-based formula. This means nearly everything that goes into this detergent is plant-based and has no harmful chemicals that could worsen your child’s allergies. It also means that there are no chemicals that can be absorbed into your child’s skin, furthering the benefits for their health. There are no artificial dyes, scents or phthalates substances, only essential oils and plant-based extracts for the light scent that this detergent has. The formula is designed to be thin and free, meaning it will simply wash out in your washing machine, leaving no trace. What's Great About It: With your budget as a parent in mind, the Mama Bear detergent comes specially designed with a 4x concentration. This means you get many more washes per bottle, saving you a ton of money, while still enjoying all the outstanding benefits. 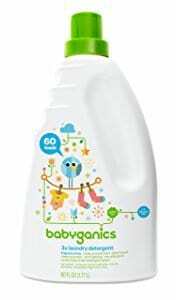 Babyganics is easily one of the most renowned baby detergents on today’s market. This special formula prides itself on being sulfate, dioxane, and fragrance-free, ensuring the maximum well-being for your child. Furthermore, this unique formula has been triple concentrated, ensuring you’re able to get the most washes out of every bottle, prolonging your detergent while maximizing your budget. Despite the gentle non-allergenic properties of this detergent, you can be safe in the knowledge that 99.9% of the stains on your baby’s clothes are completely washed out, ensuring your baby has bright, clean clothes, every day of the week. This will also stop their clothes from harboring potentially harmful bacteria. What's Great About It: Thanks to this soft yet high-performance formula, your baby will be able to enjoy clean and incredibly great smelling clothes no matter what messes they make. As your child grows, you can even use this outstanding formula as a pre-wash treatment, perfect for guaranteeing the softest clothes possible. 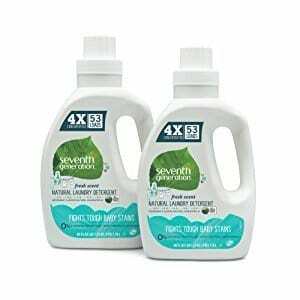 If you’re in need of a powerful yet sensitive laundry detergent that puts your baby’s health first, Seventh Generation could be the ideal detergent for you. This 4x concentrated formula means you can easily make the most out of every bottle you but while still enjoying the many benefits of a USDA approved 95% bio-based recipe that protects your child from allergy symptoms and harmful chemicals. Within each bottle, you’ll find a recipe that is free from artificial dyes, brighteners or synthetic fragrances; only all-natural ingredients that are just as powerful. This formula is lightly scented with botanical extracts and only naturally scented oils, ensuring that your baby smells incredible at all times while their clothes remain soft, cuddly and clean. Additionally, this recipe prides itself on its 4x stain removing technology that digs deep down to the core of every stain, professionally targeting them so you can be sure that your baby’s clothes are always clean and ready to be worn on whatever adventures you’re tackling that day. What's Great About It: As you can imagine from such a premium recipe, this detergent pride itself on being completely hypoallergenic, making it the perfect choice for all your baby’s clothes, diapers, bibs and any other accessories you need to wash.
As parents, we only want what is best for our child. For those parents who are willing to spend slightly more for a better quality, Mrs. Meyers has the product for you. This huge, 64-load bottle of detergent prides itself on 97% bio-based, with all the ingredients coming from natural sources. This means there’s no artificial chemicals, fragrances or any other another chemical that could potentially irritate your child’s skin. In fact, this detergent has been tested by dermatologists to prove that it’s safe for your child’s skin. What’s more, this detergent is fully compatible with both standard and high-efficiency washing machines, ensuring it’s suitable for you, no matter what machine you have. This product is not tested on animals, meaning you’re also doing good for the environment and animal welfare. What's Great About It: It’s easy to see why this is one of the most popular baby-friendly detergents on the market. In addition to all these amazing features, it’s also completely suitable for your whole family's clothes, so you can all enjoy the same benefits without having to do multiple washes. To conclude my list of favorites, I’ve chosen this outstanding laundry detergent that’s packed full of features that you are going to love. Available in two sizes of either 100 or 300 washes, you’ll never have to worry about running out. That also makes this detergent one of the best value-for-money detergents per wash. This highly concentrated detergent prides itself on its hypoallergenic products, minimizing the risk of irritating your child’s allergies or sensitive skin while the product itself is completely non-toxic and biodegradable. 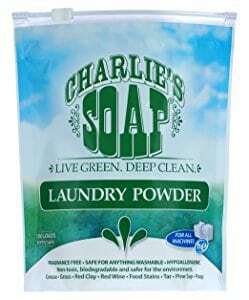 Thanks to the unique formula, this detergent is completely suitable for all kinds of fabric, whether it’s your baby’s clothes, silk, wool, or linen bed sheets; you name it, Charlie’s Soap will wash it. Not only is this product fully compatible with both standard and high-efficiency machines, it also holds the same level of effectiveness at low temperatures and in cold water, meaning you have full control over your washes, saving you money and energy, while still benefiting from the same results. What's Great About It: Having been in the business for over four decades, you’ll also be able to enjoy the added benefits of a complete child-safe detergent. There are no abrasives, phosphate, bleach, dyes, perfumes, lye or any other potentially harmful substances, putting the well-being of your child first. As you can see, there are a lot of detergents to choose from, so it’s understandable that you may feel overwhelmed. However, there’s no need to fret! 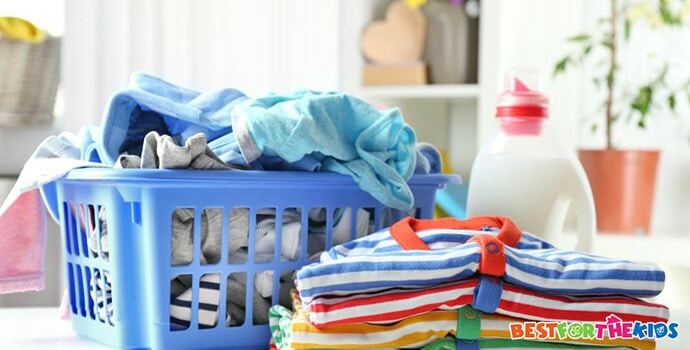 Scroll down to discover everything you need to know about baby laundry detergents. With ‘adult’ detergent, the formulas that make up each product can contain many rough and abrasive chemicals for tackling stains. While this may be okay for adults, babies have very fragile and delicate skin. In numerous cases, these chemicals, once in the clothes of your baby, can irritate your baby’s skin, something you won’t want to happen. Furthermore, if your child suffers from allergies, some detergents may trigger the symptoms of these allergies, due to the chemicals inside. One of the most common allergies is eczema, a skin condition that usually clears up on its own by the age of five or six. If you’ve ever been to your supermarket, you may have seen detergents that market themselves as being ‘free from harsh chemicals’ or ‘removes stubborn stains.’ Sounds great, so you throw it in your basket, and you’re done. However, you’d be shocked at just what chemicals go into some detergents. If a product isn’t clearly labeled as only having natural ingredients, the chances are that it’ll have artificial chemicals, risking your child's skin health. After some thorough research, you’ll actually be amazed to see what kinds of chemicals you’d find in regular laundry detergent. It contains chemicals such as Diethylene Glycol, a substance linked to many cancers and DNA defects as well as stimulating allergies and potentially damaging vision. If this is what is found in one of the 'leading' baby laundry detergents, you can see why it is so important to check every single detergent for their ingredients. Just saying that it is safe for your child does not guarantee that it is. In short, the answer is very effective! In fact, as you can see from the list, many parents are now opting for baby-friendly detergents to wash all their clothes. As parents, we know that our children make a lot of mess. From spit ups, spilled food and just general mess from who-knows-where, our baby’s clothes get filthy. For stubborn stains, such as dried up food that may have been left for a couple of hours, you may need to pre-soak the clothes, no matter what detergent you are using. However, as above, many parents are now opting for using baby-friendly detergent for all their clothes. This also means you won’t have to split washes or run small loads, saving you a ton of money in the long term. Granted, baby-safe laundry detergent is not the cheapest product on the market, especially when compared to traditional detergents that you may already be using in your home. However, with all the considerations listed above in mind, the weekly budget is still a concern for many parents. However, there’s no need to worry. As you can see from my list above, many of the child-safe detergents are highly concentrated, meaning you get more washes out of your bottle. In some cases, the detergent formula has been concentrated four times. This means you get four times the amount of washes than a regular bottle. Take Charlie’s Soap for example. With just one small scoop of powder, you can wash a full washing machine of clothes. If that’s not budget-effective, I don’t know what is. Obviously, as with most products, the bigger the bottle you buy, the cheaper the product is. Bear this in mind when choosing your product. 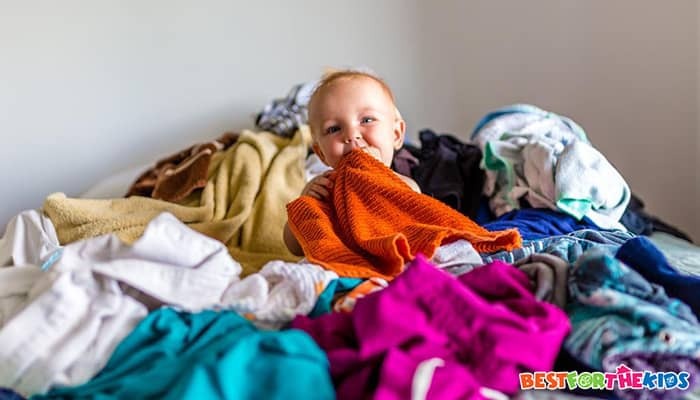 What’s more, as stated above, you can use baby-friendly detergents to wash all your clothes, saving you from having to buy any other detergents. Choosing the right laundry detergent for your family doesn’t have to be a difficult decision. Take your time in thinking what your baby needs, whether they have respiratory problems or sensitive skin. Then you can match your requirements to find the product that’s right for you, effortlessly. Always remember that despite there being a ton of brands to choose from, your child’s well-being should always be your main concern.